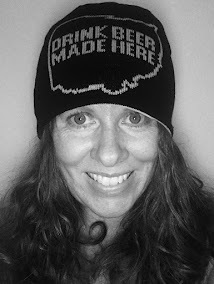 I've been tasting my way around Columbus, Ohio breweries since moving to town this year. 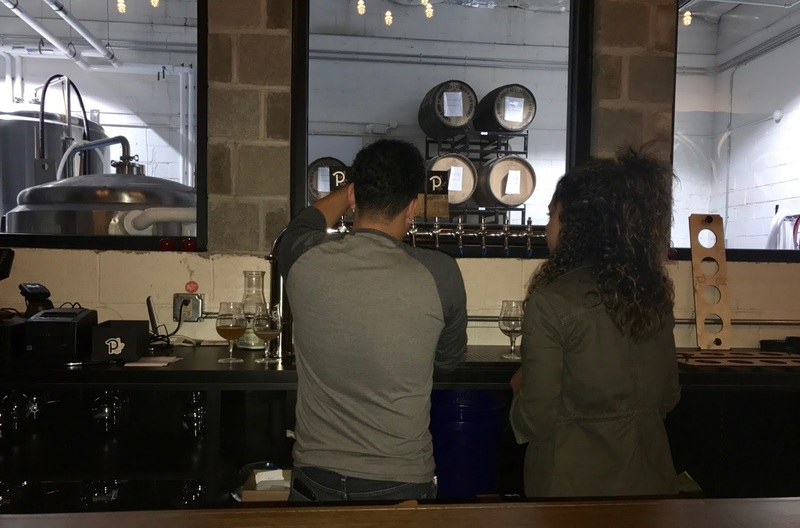 I've been to every brewery with an open taproom at least once, and I'm subscribed to several social media sites or mailing lists to learn about all things beer. So it came as a surprise when I found out, quite accidentally, that there was a new brewery in town. Pretentious Barrel House opened on October 14, 2017 in an unassuming neighborhood on the East side of Columbus. I made a point to get out there the very day I learned of its existence. Pretentious Barrel House, run by owner and brewer Josh Martinez, specializes in sour beers. While I enjoy all beer styles, I do have a soft spot for sours. I arrived shortly before closing on a Sunday evening and the crowd had left for the night. Lucky for me, I had my own one-on-one tasting and conversation with Josh. I learned that he chose to focus on sours because they offer the most room for creativity in the beer world, not having strict style constraints like most other beers. The actual brewing process is done off-site at Four String Brewing's Hague Avenue facility, but the fermentation and the magic occur in the barrel house. 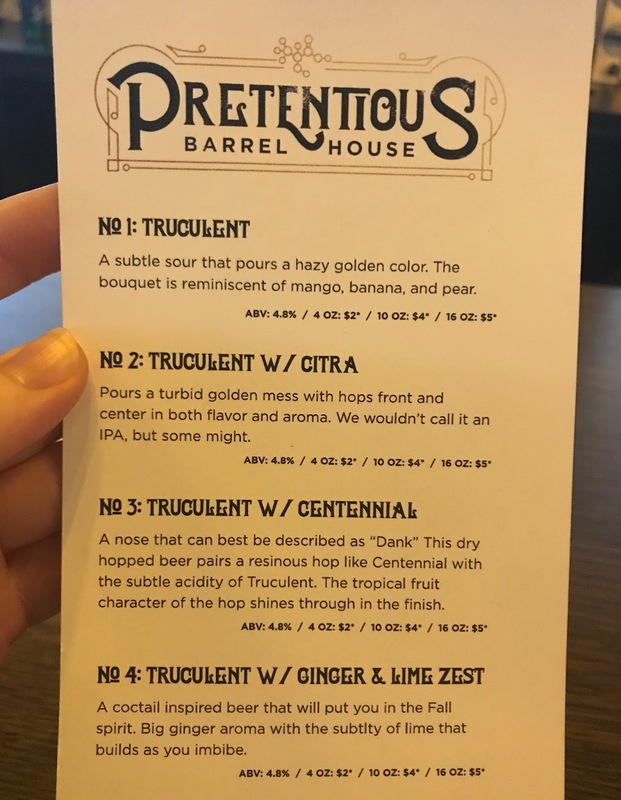 The week's festivities had tapped out some of the grand opening brews, so what was left for me to try were four versions of Truculent, one of the Pretentious signature sour ales. My first pour was the classic Truculent, described as "a subtle sour that pours a hazy golden color...bouquet is reminiscent of mango, banana, and pear" (via Untappd). I liked it immediately. The second and third Truculent varieties were dry-hopped with Citra hops and Centennial hops, respectively, and the fourth was infused with ginger and lime. All were smooth and drinkable, but I preferred the two hopped varieties. Initial draft list - there's more now! While the "Pretentious" moniker doesn't exactly describe Josh or his brews, it might apply more to the taproom décor. This was not a casually thrown-together taproom like I've seen at many breweries that focus on the beer at the expense of the atmosphere in which it's enjoyed. Pretentious Barrel House excels at ambiance. 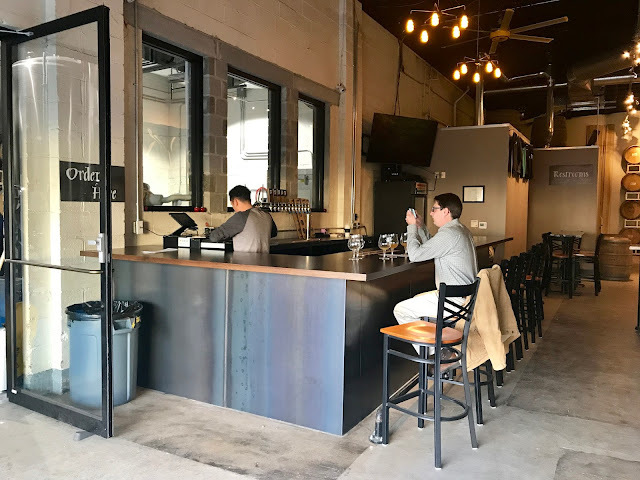 It has a simple but thoughtfully designed interior with a picture window looking into the back room containing the fermentation tanks and barrels. During nice weather, the oversized garage door can be opened to let in fresh air while creating a larger open space and providing easy access to the wooden picnic tables outside. But the focus is really on the wall opposite the bar. 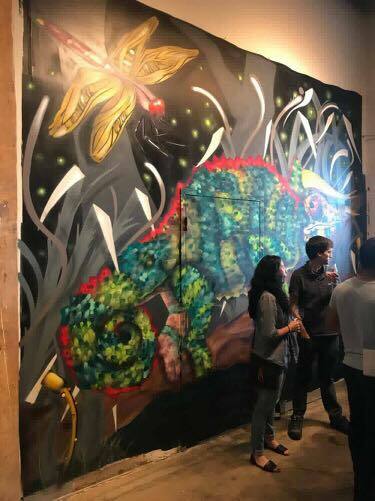 Here, you'll find a triptych mural, each panel a unique design by a different local artist (Monster Steve, Dr. Selrz and Katchup). The three works complement each other brilliantly. The colorful artwork carries over to the brewery's truck, which was parked out front on my visit. Josh, a chemist by trade, has been brewing since before he could legally drink his creations. Like many, he started as a home brewer. He honed his beer palate in and around the many breweries in San Diego, and then worked for a brewery in Lexington, Kentucky. After settling in Columbus with his wife, a resident at the Ohio State University Medical Center, Josh decided to launch his own venture. I was impressed by how put-together everything was for being open just over a week. Attention went into every detail, down to the tulip glassware and the Pretentious stickers. And science geeks might notice that the Pretentious logo is a molecule of lactic acid, which is a key component in brewing sour beers. I enjoyed my first visit to Pretentious Barrel House so much that I went back less than a week later. This time, it was on a Thursday after work. The happy hour crowd started out light, but patrons trickled in throughout the evening, and everyone seemed to enjoy the sour brews. There was a fifth Truculent on tap, this one dry-hopped with Azacca and Idaho 7 hops, and it was good. Before the evening got busy, I had the chance to meet the rest of the core team. Luis Gutierrez is a partner and runs the taproom. Jullian Gonçalves manages the back office. They've all been putting in long hours to make things just right, and it shows. There's even talk about expanding the space, already! 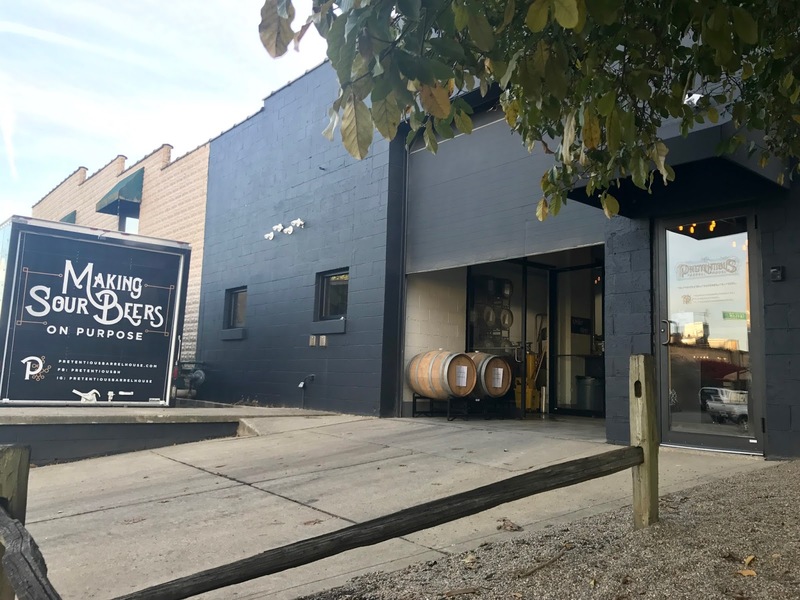 Pretentious Barrel House is definitely catering to a distinctive brewery clientele with its exclusive offering of sour beers. The brewery will appeal to the hipster crowd as well as to classic beer geeks like myself. I plan to return again as Josh adds more beers to his lineup (a sour red ale awaits me). Even if you're not sure about sour beer, I say give it a try. There is variety among just the Truculent series, and there's possibly something for everyone (unless all you drink are dark, malty beers). You'll also find Truculent on tap at select local bars and restaurants, but for the best experience, go to the source. Currently, Pretentious Barrel House is open four days a week: Thursday 4-9 PM, Friday 4-10 PM, Saturday 1-10 PM and Sunday 1-8 PM. You'll find food trucks most nights (Zone 5 BBQ is a favorite); just follow the brewery on Instagram and Facebook for the lineup. 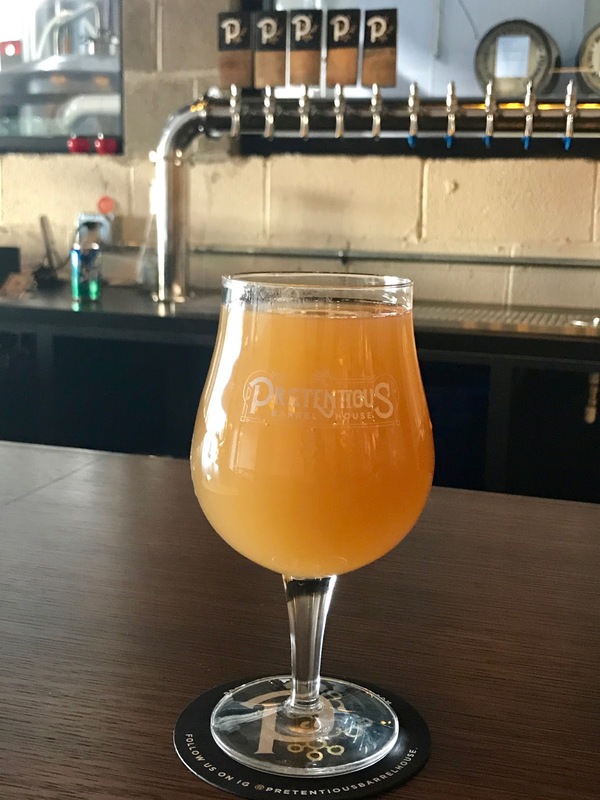 Check out Pretentious at pretentiousbarrelhouse.com. And tell Josh, Luis and Jullian I said hi. Another weekend, another microbrewery opening. The craft beer explosion shows no signs of slowing down as new, small breweries continue to open and fill in gaps on the map. 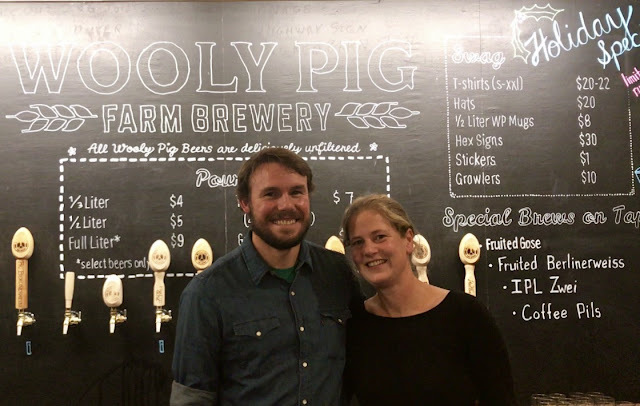 I had the pleasure of visiting Wooly Pig Farm Brewery (Fresno, Ohio, USA) during its grand opening weekend. The Farm Fresno, Ohio was unknown to me until I visited Wooly Pig. It's a township east of Columbus and south of Cleveland, with a fair amount of farmland and more animals than people. And now it's home to a farm-based craft brewery named for the fuzzy porcine residents of the farm. In fact, as I concluded my 90-minute drive from Columbus, I was greeted by the wooly (mangalitsa) pigs who were grazing in the pasture adjacent to the gravel parking lot. The pigs were curious as I walked up to the fence (it's electric, so don't touch!) to say hello and to photograph them. I didn't get too close to the cute piglets, as their mothers were vocally protective of them. The first week of November in northeastern Ohio brings crisp, cool weather and colorful foliage of ambers and reds. 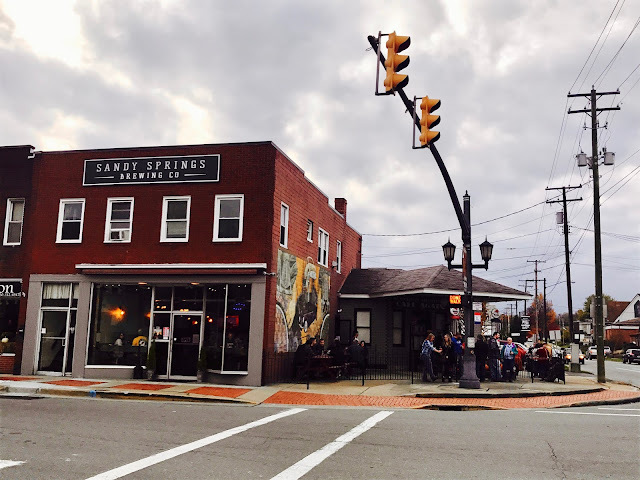 This year it also brought the grand opening of Sandy Springs Brewing Co. in the quaint town of Minerva. And the taps flowed with brews in those beautiful autumn hues. I do like to visit a brewery on its opening weekend, and this was my third time doing so this season. 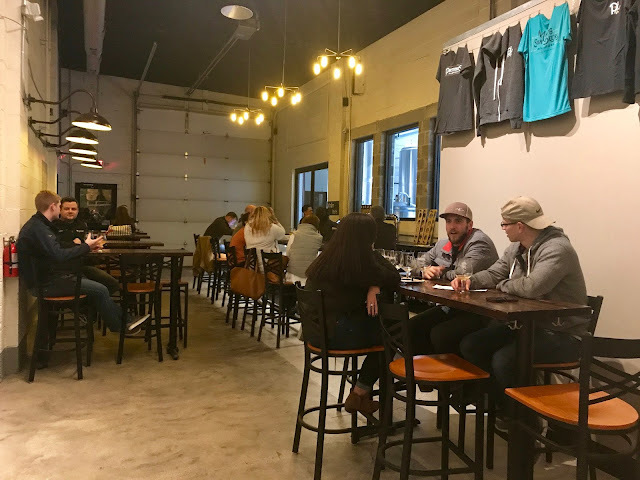 Everything I saw on social media indicated that this little brewery in an out-of-the-way Ohio town would be well worth my time, and it certainly was.